Day One, and already she was lying in her journal. 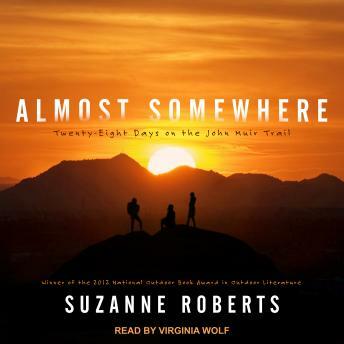 It was 1993, Suzanne Roberts had just finished college, and when her friend suggested they hike California's John Muir Trail, the adventure sounded like the perfect distraction from a difficult home life and thoughts about the future. But she never imagined that the twenty-eight-day hike would change her life. Part memoir, part nature writing, part travelogue, Almost Somewhere is Roberts's account of that hike. John Muir had written of the Sierra Nevada as a 'vast range of light,' and this was exactly what Roberts was looking for. But traveling with two girlfriends, one experienced and unflappable and the other inexperienced and bulimic, she quickly discovered that she needed a new frame of reference. Her story of a month in the backcountry-confronting bears, snowy passes, broken equipment, injuries, and strange men-is as much about finding a woman's way into outdoor experience as it is about the natural world she so eloquently describes. Candid and funny and, finally, wise, Almost Somewhere is not just the whimsical coming-of-age story of a young woman ill-prepared for a month in the mountains but also the reflection of a distinctly feminine view of nature.